"The world is undergoing a phenomenally fast wave of urban growth. Research that can help tackle some of the ensuing problems is likely to originate in cities themselves. Humanity has evolved into an urban species. Already, more than half the planet's population lives in cities and this fraction is expected to rise to 70% by 2070. The speed and scale of urban growth poses significant social, economic and environmental challenges, such as ensuring that the 10 million or so inhabitants of megacities have access to adequate supplies of food and clean water each day. But urban areas also concentrate and foster human ingenuity. Innovative solutions to the problems of the twenty-first century, ranging from climate change and poverty to energy supply, are most likely to be thought up in the stimulating environments that make up urban centres. In this way, cities could help to mitigate the ill effects of an ever-crowding planet. [And it's] not only general urbanization that is on the rise. 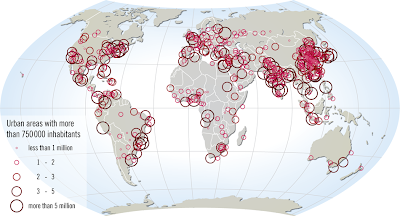 The number of megacities is also set to increase. Some of the fastest urban growth is taking place in developing countries in Asia and Africa, where the reality for many city dwellers is extreme poverty, along with poor sanitation and a shortage of clean water. [Therefore] city leaders have plenty of reasons to facilitate innovation [...] Urbanization shows no sign of slowing down. Political will to tackle some of the ensuing problems seems to be emerging at the city level, but needs to be backed up by a thorough understanding of the threats facing cities, and potential ways forward. Research conducted in cities, and on the topic of cities, will help to bridge this gap." Our own efforts at MIT including many efforts at the Media Lab towards enabling smart, vibrant, and responsive cities. But far more work in urban planning, dynamic pricing and economics, architectural design, real estate development, energy innovation, transport and logistics, environmental sustainability, ecosystems science and engineering, and more, are all urgently needed.